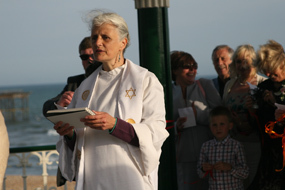 I was ordained as an Interfaith Minister in 2003. 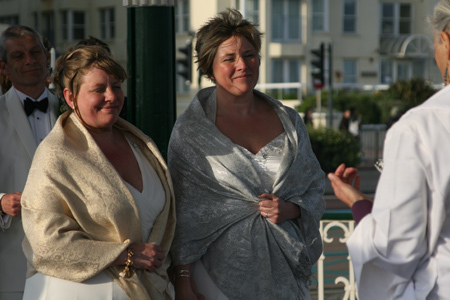 I love to create individual marriage and handfasting ceremonies for couples. It is important to me to work alongside my clients to create a ceremony which reflects their individual spirits and beliefs. It is an absolute honour to be asked to be involved in such an important occasion in someone’s life. In creating ceremonies I make sure that there is a lot of communication between me and you, so that your marriage or civil partnership, is exactly what you want it to be; and remains a treasured memory into your future. 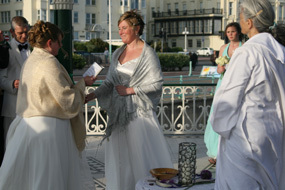 See below for a testimonial from a couple I did a handfasting ceremony for in Sussex in May 2010. At our initial meeting Sarah discussed in detail what we would like the feel of our ceremony to be. She asked comprehensive and pertinent questions. From this initial meeting she was able to put together a beautiful first draft of what would become our ceremony. Sarah came to our first meeting armed with lots of ideas for further information and really helpful books to help with our vows. She also left us a ‘handfasting manual’ which allowed us to look at different ceremonies and get a real feel for what we wanted. Sarah took on boards all of our requests, comments and ideas with regard to the ceremony and, with our input, produced for us what was a wonderful and heartfelt ceremony that enabled us to involve our family and friends. It felt as important to Sarah as it was to us that our ceremony be just as we wanted it, that everything would run smoothly on the day and allow everyone there to be fully involved and to celebrate with us. Even though ( as these things are) we ran slightly late on the day and everyone was very excitable, Sarah took all of this in her stride and was able to go with it. This was a part of our special day that everybody loved, especially us and will now be a memory for many to treasure.